One last time I'm trying to loose extra weight for good. Yeah its not an ad so whether I succeed or not? Who knows - but I'm gonna try! Nearly 50, female, not happy with my weight! Really, how unusual, NOT! I'm the queen of diets - been there done that as they say: Weight Watchers, Atkins, South Beach, Grapefruit - done them all. Some of them even got me to lose weight - for a while. Didn't work long-term though. This time - though its going to be different. Well not quite 50 - I have a few months to spare - so shall we say weight loss for the nearly menopausal woman anyways? This is my personal search for a long-term sustainable weight loss. Time to get serious. I've been over weight for years - but now its starting to scare me - time to change. Danger ugly photos! The trouble with rapid weight loss, is that the weight won't stay off for long that much I know. Rapid weight loss if fine if you are a boxer or jockey or some other professional that needs to be under a certain weight on a certain date. For the rest of us its not just a waste of effort, its also a great way to set yourself up for even more weight gain. So What Is Wrong With My Diet? balanced meal with 2-3 vegetables, lean meat (usually chicken), no added salt. Actually that's a bad day! I only do the afternoon chocolate run about 3 days a week, and actually we've already cut out the chips with the drinks before dinner (though not the drinks!) I probably only drink about 5 nights a week. Best Weight Loss Diet . For some reason, the body is pretty conservative. I travel a lot, and a lots of tourists go to Asia and immediately get sick. They blame it on poor hygiene on the part of the locals. But the locals don't get sick, nether do I normally. That's because I eat Asian food at home at least once a week. If you NEVER eat curry, rice or Tom Yum soup - what do you think your body is going to do if you suddenly start doing it two or three times a day. Stay home and camp in your local Chinatown - and eat local - see what happens - exactly the same I'm sure. My body is a finely tuned machine - it knows EXACTLY when its being starved and it slows down my metabolism ASAP, to wait until its usual chocolate quota is returned. Frankly - short of a definite and immediate life-threatening disease, diagnosed by my doctor - I don't do hungry voluntarily! So I'm not quite sure why I tried fasting for weight loss, low-calorie diets, the lot. None of them worked, because they weren't sustainable - for me. Now some people I know can sustain being hungry and going low-calorie - I know a woman who has done it for decades - but not me - and not a lot of other people if I look around me! I Like Food - Its A Problem When Trying to Lose Weight! I've know for many years that I like protein: I'm afraid wouldn't even consider a vegetarian weight loss diet - because I would be bored inside a day. I like meat, fish, cheese, etc etc. What I didn't know about was the "Protein Leverage Hypothesis" - which is a scholary study which reported that when study participants lowered their protein in the diet from 15% to 10% they ate 12% more calories overall. Why? Because they were full and stopped eating. Salad with cheese and/or salmon, tuna or chicken. 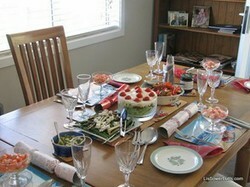 I'll try to cut out the snacks and leave dinner alone for the moment - see if this still feels reasonable in a week! This is a diet in progress - I'll update as change things up and around and see what does and does not work! Similar to mine - the coating is incredible - and you really just fry eggs in it with no spray or oil! This is not Teflon coating - it actually works and doesn't come off in a few months! What Are Your Top Weight Loss Tips? Hi Lissie, I found this site (http://myfitnessmotivator.com) a while ago and the woman running it basically lost weight using a low calorie diet. I've tried it myself and it's worked for me! I haven't had a detailed look at your menu, but for me, that's a bit more than what I eat now (except on weekends when I gorge!). For instance, I try to keep my breakfast + morning snack within 250 calories, which means a slice of raisin toast and an apple as the snack! For me it's now all about counting the calories! Also, I'm like you - I like sugar or salty stuff as a snack. So I have dried apricots (another suggestion I found on that blog) when I'm in a sweet mood, and peanuts/almonds (counted out carefully!) when I'm in a salty mood. It's tough to eat less the first few days, but over time you get used to it. "What I didn't know about was the "Protein Leverage Hypothesis" - which is a scholary study which reported that when study participants lowered their protein in the diet from 15% to 10% they ate 12% more calories overall. Why? Because they were full and stopped eating. " I don´t quite get that bit ... they were full and stopped eating when lowering their protein? iaw, less protein makes you less hungry? @katiem - yes becoming aware of eating is helping I'm thinking - and considering how close it its to Easter -when I want to wear a latin costume in front of an audience! I already do more than 30 minutes exercise most days - a lot more - but I am trying breaking the exercise up through the day. For me it's move more. I eat pretty well and could do without meat, so I like to eat fish and veggies. If I didn't have a teenage boy to cook for, my diet would be even healthier. My problem is that I sit at the computer to work and therefore don't get enough good exercise in a day. I'm trying to change that, but at my age (definitely over 50!) results will not be seen quickly. Good luck to you. Don't cut out the snacks, in fact add them in. I small one between meals, an apple, 8-10 almonds, bit of cottage cheese or similar. Raise the protein, lower the carbs, eat 6 times a day & get off the couch for 30 minutes or so did it for me.